Most of us know that when it comes to getting plenty of essential vitamins every day eating plenty of fresh vegetables is a great place to start. Not all our required daily vitamins come from vegetables of course, but plenty do. So what should we be eating, and how should we be storing and cooking it? Fresh vegetables. Those two words just seem to go together. But can we get all the same vitamins and health benefits from eating frozen vegetables? Well it all depends on how fresh is fresh! As soon as your vegetables are harvested, their vitamin content starts to go down. So if you’re sure that your vegetables are fresh off the farm and that they haven’t been hanging around in your vegetable rack for a week, then you can be sure you’re getting a whole host of vitamins whenever you eat vegetables. But it’s often the case that vegetables have been stored – by farmers, by shops and supermarkets, and by us in our own homes. If your vegetables were harvested some time ago, there might not be too many vitamins left in them by the time they reach your plate. This is where frozen food comes in. When food is frozen, the vitamins stay locked in. So food that comes straight out of the fields and is flash frozen will still be choc-full of nutrients when you open the bag. So although fresh in fab, don’t feel guilty about piling your plate high with lovely vegetables that have come out of the freezer. Of course, some vegetables, like potatoes and sweet potatoes, need to be cooked. But when it comes to anything green and leafy or red and juicy, try to cook things as lightly as possible, or eat them raw. That’s because many vitamins – including vitamin C – are destroyed by heat. So try to get into the habit of eating at least one raw thing every day. It doesn’t have to be much, and you might start to really enjoy the variety of new tastes. Although dairy products, meat, fish, fruit and eggs contain vitamins, it’s fairly easy to get most of your required daily vitamins from vegetables. It’s the B vitamins that are least commonly found in vegetables, but there are plenty of other healthy, crunch and savoury alternatives to choose to make sure you’re getting enough of these. Vitamin A, or the beta-carotene that your body converts into vitamin A, is an antioxidant vitamin and can be found in abundance in carrots, spinach, butternut squash, sweet potatoes, pumpkin, peppers and watercress. Vitamin B2, unlike some other B vitamins, can be readily found green leafy vegetables like lettuce and cabbage. Just be sure to cook them lightly or eat them raw or risk destroying the vitamin content. Vitamin B2 is also in mushrooms. But these aren’t necessarily the best sources of vitamin B2. So supplement your vegetables with avocado, millet and whole grains to be sure you’re getting enough. 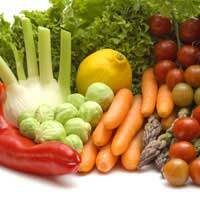 Folic acid, or folate, is another B vitamin that you can find in vegetables. It’s in spinach and broccoli, as well as other savoury options like peanuts, almonds and hazelnuts. Antioxidant vitamin C is famous for being found in fruits like oranges, blueberries and strawberries. But can you find it in vegetables too? The short answer is a resounding yes! Particularly good sources include broccoli and crunchy peppers amongst many others. Skin-loving antioxidant vitamin E is found in broccoli, sprouts, spinach, and vegetable oils. So although many people think about eggs first when they’re bumping up their vitamin E, there are vegetable sources available too. Little-known vitamin K is but an essential nutrient for supporting normal blood clotting and the development of bone structure. Great vegetable sources include cauliflower, cabbage and spinach. No matter how much you love your veg, it’s not really sensible to try to get all of your vitamins from vegetables alone. The B vitamins, in particular, can be difficult to source just from veg. Here are some of the key ones to consider. Though not really found in any quantity in vegetables, you could try adding brazil nuts, peanuts, rice, bran, or sunflower seeds to your diet if you’re looking for plant-based ways to eat vitamin B1. You can get some of your vitamin B3 from mushrooms, but other than that you might want to consider adding sesame seeds, peanuts and wholemeal bread to the menu. Difficult to find in vegetables, you might want to consider hazelnuts, bananas, peanuts, bran and currants instead. Vitamin B12 isn’t found in veg and unlike some of the B vitamins we’ve already mentioned, it’s not in any plant-based foods either. It is in eggs and dairy products though, and vegans can get theirs from yeast extract, or some fortified cereals and soya milks. This is another key vitamin that you can’t get from vegetables. Many people get their vitamin D from dairy products, but exposing your skin to sunlight will enable your body to manufacture vitamin D for itself. There’s no doubt about it, vegetables are pretty much essential for a balanced diet and a healthy body. The key is to eat as wide a variety as possible. Don’t just stick to cabbage and carrots day in and day out. Be adventurous! How about watercress, chicory, kohl rabi, Jerusalem artichoke, okra, celeriac and aubergine for a change? And don’t forget to try a little something raw every day. Grate some white cabbage onto your salad, or nibble on some celery with your cheese sandwich. Vegetables pack a bit vitamin punch, so make sure you get yours every day.